I've done post high school planning with two of my kids. The road was different for my NON-HOMESCHOOLED kid and my HOMESCHOOLED kid only because the resources and freedom for each was different. As a homeschooler, your child has many more opportunities to explore their roadmap for graduation and beyond. But first you have to sit with the student to work out a plan. Most kids have no idea what they want to be in 10 years much less next year. But there are ways to get them to start thinking about it. Let's face it, it is their lives. (1) Ask them, "What Kind Of Life Do You Want When You Grow Up?" This includes: House, car, location where you want to live, spending money, clothes, student loans and 'toys', wife/husband and kids? Activity: Have your child search the internet for all of the things above that they'd like to have in their life. Outcome: Make a yearly and monthly budget for the items they have on their list. 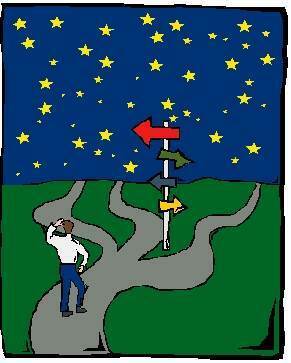 (2) Have them select 3 possible career paths that interests them. This includes: Cost to obtain the stated career: Pathway to college, trade school, military, working way through, colleges of choice, training of choice. Activity: Map out the cost to obtain specified careers: Yearly and monthly incomes of each, hidden cost of each. Outcome: Monthly and weekly paycheck minus taxes and health benefits cost. (3) Compare Income of 3 different careers with Lifestyle Budget (monthly/yearly) of each. This includes: Incomes of all chosen careers - base salary on the starting year salary of each career. Activity: Have child remove 'wants' and 'rank' the career choices selected. Outcome: Student should have an idea of what it takes to maintain a household, where their chosen career fits in. (4) Mapping your way to chosen careers. This includes: Making a 4 year course plan for the top 2 careers of choice. Have student select courses with you. Also, compare to possible colleges that meet your budgets and their requirements. Activity: Build a table or grid, listing all the classes that would support success in (1) meeting state standards for graduation (2) meeting the needs of the chosen career paths (3) exploring other interest the child has. Outcome: The student is now invested in the plan. (5) Validate High School Course Plan. This includes: Meeting with Community College counselors about benefits of 'Dual Credit' options and even gaining an Associate's Degree in complementing fields prior to attending '4-year Universities'. Activity: Have student interview both Community College counselors, Career Mentors and prospective college counselors - early in their high school years. Outcome: This will make your high school years both fun and teach your student how to map their own way if they should change their minds. WHAT HAVE YOU DONE TO MAP YOUR HIGH SCHOOLERS ROAD TO GRADUATION?